Trash the dress, also known as fearless bridal or rock the frock, is a style of wedding photography that contrasts elegant clothing with an environment in which it is out of place. It is generally shot in the style of fashion and glamour photography.Usually brides decide to have pictures taken on the beach, but other locations include city streets, rooftops, garbage dumps, fields, and abandoned buildings.Some sources claim that the trend was originally started in 2001 by Las Vegas wedding photographer John Michael Cooper. However, the idea of destroying a wedding dress has been used in Hollywood symbolically since at least October 1998 when Meg Cummings of the show Sunset Beach ran into the ocean in her wedding dress after her wedding was badly interrupted.A model often wears a ball gown, prom dress or wedding dress, and may effectively ruin the dress in the process by getting it wet, dirty or in extreme circumstances tearing or destroying the garment. It may be done as an additional shoot after the wedding, almost as a declaration that the wedding is done and the dress will not be used again. It is seen as an alternative to storing the dress away, never to be seen again. Know Racheal thru another couple 10 months ago. From time to time we do chat online for some crazy ideas on her wedding days including games and even trash the dress ideas sharing. And yes!!! lol she agree on my suggestion and best is we are doing it immediately after the tea ceremony, a real trash the dress concept !! I met both Adrian and Racheal recently on my Australia Prewedding Trip for a quick drink. They are really nice and friendly, of course fun couple.. hope to see you again ya!! Edwin Lay - wooo… sweet… especially the torch part! Pamelyn Tan-Corsi - Very creative and it’s a great and fresh idea. Keep up the wonderful work. I enjoy viewing your photos. Anthony Phan - Wow lau arh bro. doing it real……this is a very expensive creative style of P. shooting ! Thanks for sharing. Eddie Lee - Edwin, awesome stuff man!!!! You guys are pace setter!!! suan gaik - Good work! How about a “trash the suit” series too for the guy? hehehe……. Laurel Austin - They torched it! You are so creative! And they are so willing! Audrey Tan - Oh..gosh. Is so creative and artistic. Keep up the good work Edwin. Jess Poh - this is absolutely brilliant. I love the concept of it.. and your shots are top notch! Your post production is flawless, would love to pick up a few tips from ya. 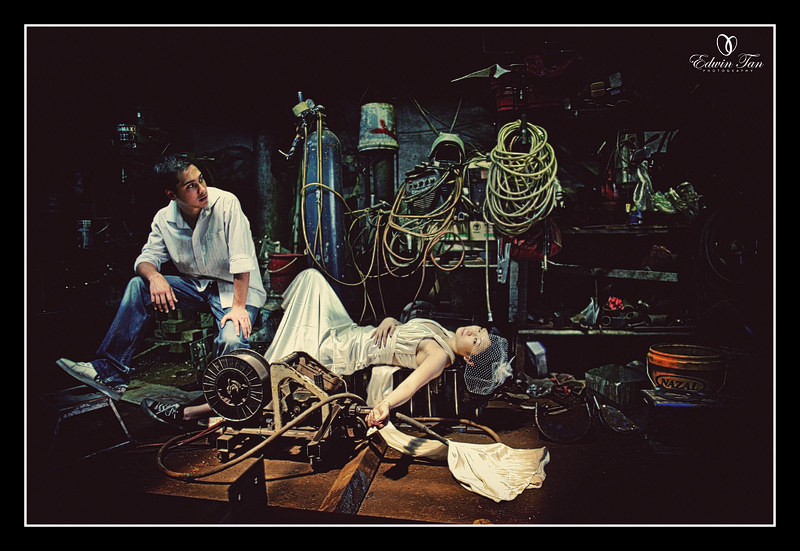 Ken Wong - Cool photos! Excellent job! !